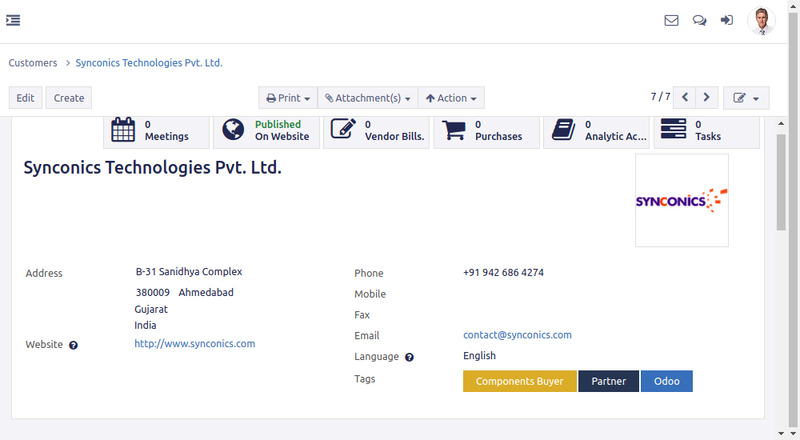 CRM | Synconics Technologies Pvt. Ltd.
customers and win back former customers. Email Templates: Create template of emails for most common communications with your customers or opportunities. Custom Alerts: Follow key opportunities in just a click and get alerts based on relevant activities. 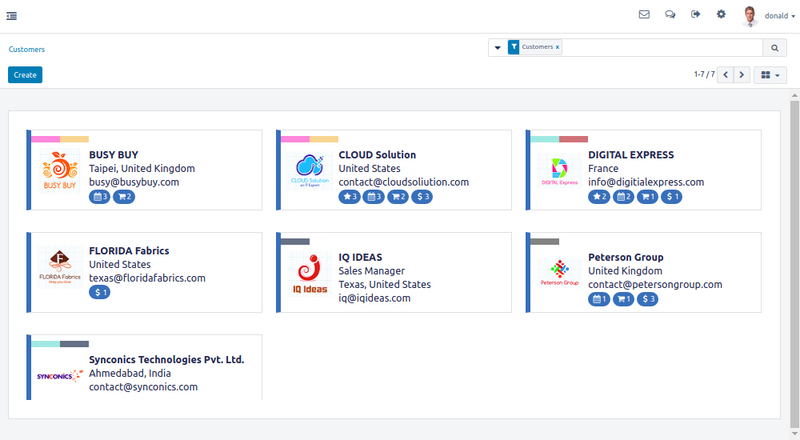 Email Gateways: Get all your email communications automatically attached to the right opportunity. Create new leads automatically based on incoming emails. 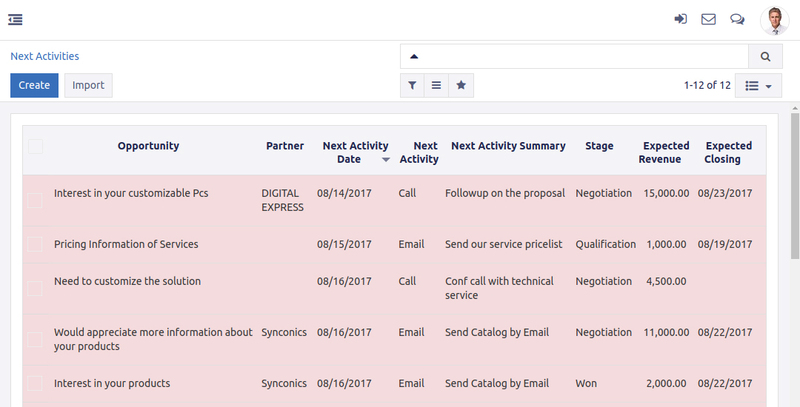 Get more done in less time: Automate activities based on your sales scripts: calls, meetings, mailing and quotations. Get all information you need, directly on the opportunity: page viewed, mail received etc. Reduce data entry: Get leads automatically created from emails, VoIP calls. Send quotes in just a few clicks, manage your pipeline with drag & drop etc. Log Calls: Log calls or trigger VoIP calls in just a few clicks. Odoo proposes to automatically reschedule the next action after the call. Ask questions & give answers: Simply register on the forum to post questions and answer existing ones. Share link: Submit interesting content from any website to the whole community and start regular discussions threads. Leads Nurturing: Create campaigns to automatically send emails tailored to the lead segment and activities of the lead. 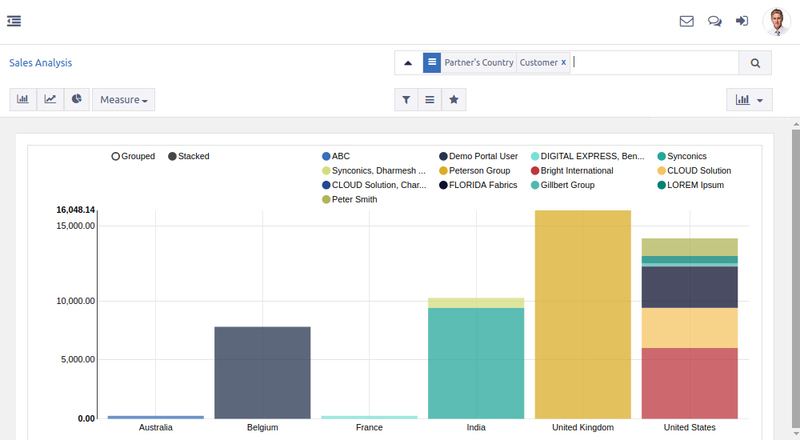 Lead Scoring: Score your leads based on explicit and implicit criteria (on pages viewed, localisation, time). Define different actions based on lead score and team assignation rules. Decide which total score deserves to be converted into an opportunity. Import Leads: Easily import prospects files with column matching tool. De-duplication: Get proposition of leads to merge when converting a lead into an opportunity. 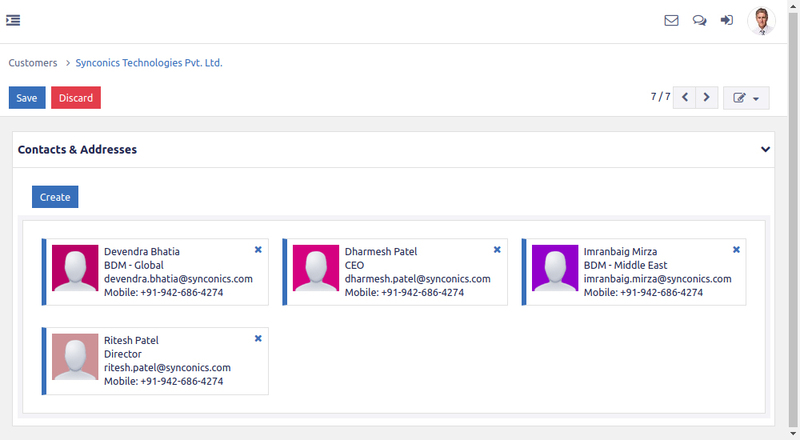 Create contacts automatically based on leads. Assignation Rules: Define your own rules to assign leads to the right sales team or sales person based on quotas and segments. Notifications: Subscribe to interesting content and get email alerts when a new answer is posted. Activities and calls management: Organize sequence of activities per opportunity. Schedule activities: Log every activity immediately in the opportunity's chatter with predefined actions. Track, log and analyse the activities of your team. Pipeline management: Get a clear overview of the opportunity pipeline. Work faster with the drag & drop interface. Set up specific stages for each sales team. Possibility to create sub-stages to better organize the processes. Automatic archiving of lost opportunities. Manual archiving of other opportunities. Lost is no longer a stage but a separate field, enabling more powerful analysis of pipeline - e.g. Lost ratio per stage. Schedule Meetings: Schedule meetings from the opportunity of customer. Sync with mobile phone and Google calendar. Plan Next Actions: Plan next actions and schedule your daily work based on most important opportunities and tasks. 360° Visibility: Get all information right into the opportunity: pages visited on your website, mails, meetings, next actions, preceding orders etc. Lost reasons: Analyze lost reasons on your opportunities to improve your sales effectiveness. Address Book: Get a clear address book shared amongst your sales persons. Customer Preferences: Set customer preferences easily: language, delivery methods, financial data etc. Multi-Address: Have multiple addresses and contacts for a single company. 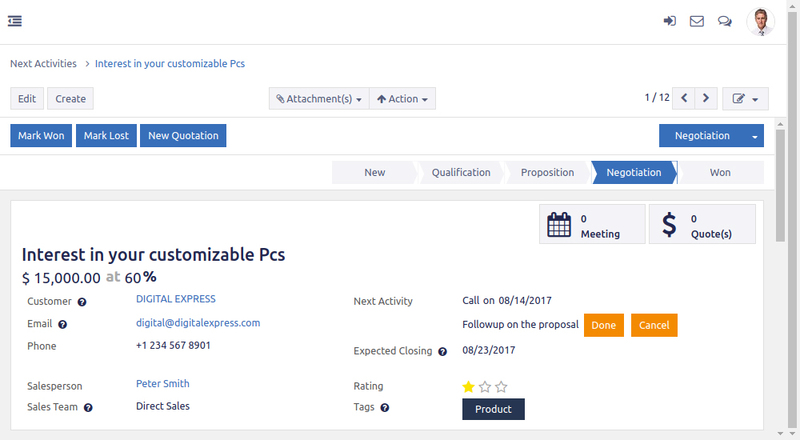 Full History: Get the full history of activities attached to any customer: opportunities, orders, invoices, total due etc. Stay connected to your customers: Real-time messaging to enhance collaboration. See when a colleague logs a call or send a quote. Share ideas and files in real-time and catch-up things you missed when you were away. Get accurate forecasts: Design custom dashboards and dig deeper with real-time reports and flow charts that anyone can create and share. Modern User Interface: An intuitive user interface designed for sales. 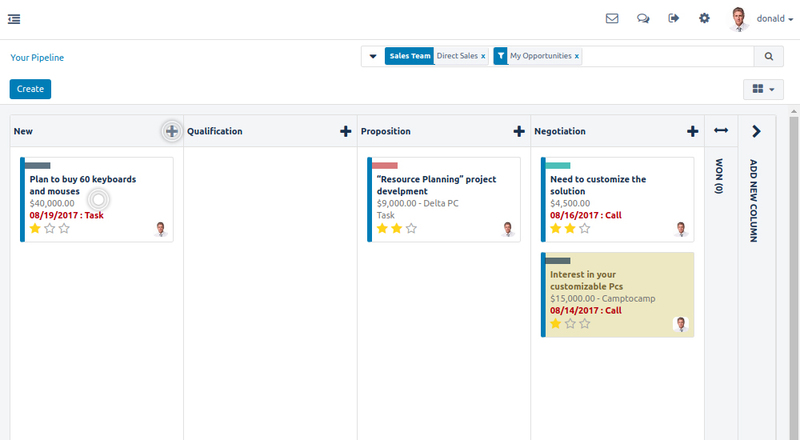 A Dashboard for a better overview of the sales activities. Useful tips and best practices to configure and deploy your CRM. 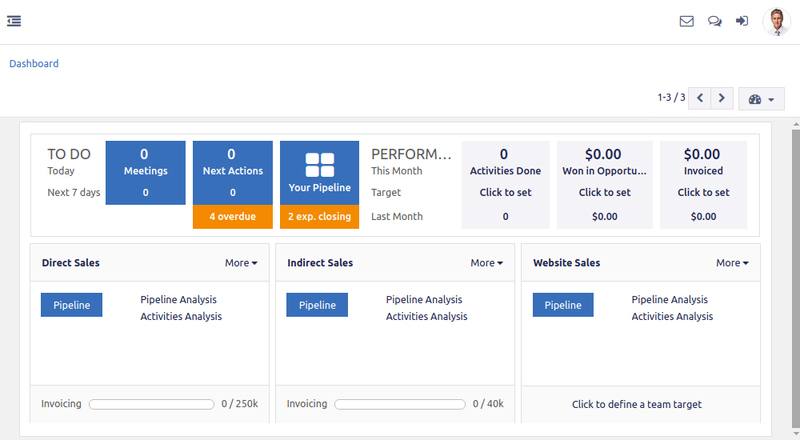 Opportunities Analysis: Analyse your opportunities pipeline with advanced filters, grouping, drill down etc. Leads Analysis: Get statistics about your sources of leads to evaluate the ROI of your marketing campaigns.